Yesterday I had finished the crown of Thing 2’s new hat. The next step was to crochet “even” rounds until I had reached the length I wanted for the sides of the hat. Crocheting even means that I work 1 stitch in each stitch. But how do I know what length I wanted the sides to be? I had taken 2 measurements when I was getting ready to crochet this hat originally. One was the circumference of Thing 2’s head, the second one was the “depth” of the hat. Thing 2 likes his hats to cover his ears well. He has short hair and wants his ears well covered. When I took the depth measurement I placed one end of my measuring tape below his ear and took the tape over the top of his head to the matching spot under his other ear. That measurement was 16 1/2 inches. 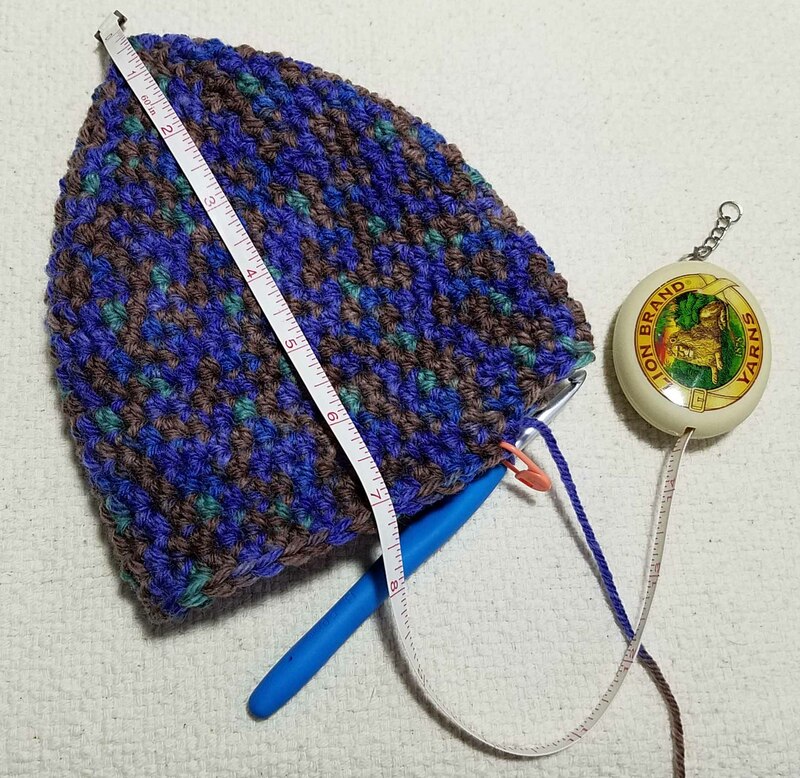 When I am working on the hat though, it is less cumbersome to measure the depth by placing the end of the tape at the top center of the crown and read the tape at the bottom edge of the hat. Which means I divide my original measurement in half. My target length for the depth of Thing 2’s hat is 8 1/4 inches. 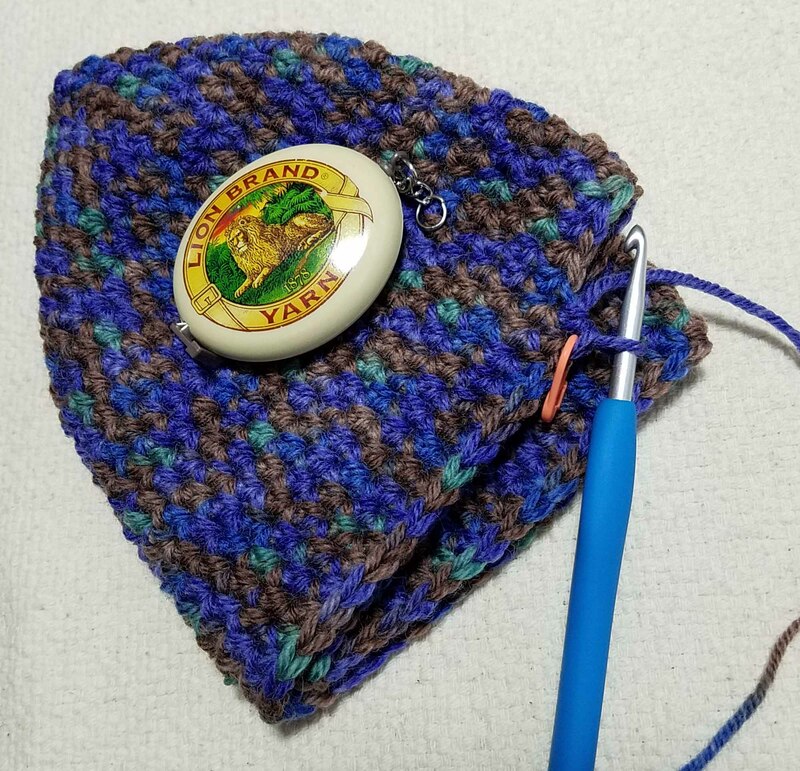 As I get closer to the depth I want my hat I fold it in quarters and measure the length to see how many more rounds I need to crochet. I’m going to want about an inch of ribbing at the opening of the hat, so I know I need to work even rounds until my measurement from the crown is 7 1/4 inches. Then I will switch to working Front and Back post ribbing. My favorite stitch for hats is the half-double crochet. It’s a great stitch for combining flexibility and density. It also makes for an awesome ribbing using post stitches. I’ll show you all about post stitches and how I make my ribbing for my hats in tomorrow’s post.